Have you ever been on a website where you waited for something to happen? Maybe it was on the Yahoo Mail website where you have been waiting for the registration confirmation email of a service that you just registered with, or you are on eBay waiting for the auction to end. If you are impatient, you may have tapped on the F5 key every few seconds to reload the page to see if anything has changed yet. That’s fine and doable if you are waiting for one page to reload with the information you are looking for, but what if you are monitoring two auctions on eBay? That’s where Auto Refresh for the Firefox web browser may help you out with. The free add-on allows you to refresh individual pages or groups of pages in select intervals. A right-click on a page opens the context menu with the new Auto Refresh entry added to it. Here you can enable the automatic reloading of the current page, or all open tabs of the browser. You can select the reload interval here as well, ranging from every 2 seconds to once per hour. The interval can be randomized to make it look more natural. The intervals can be edited in the add-on preferences to suite individual needs. You can furthermore switch from standard refresh to hard refresh. While not explained anywhere, it is likely that the latter bypasses the browser cache to request all information from the web server the page is hosted on again. Auto Refresh adds an icon to the status bar which links to the add-on preferences and instructions on the developer website. This icon can be disabled in the preferences. 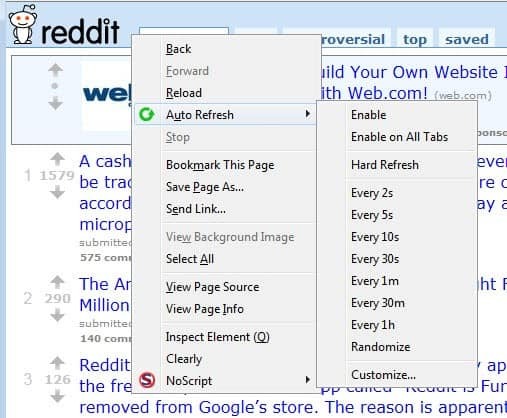 The Firefox extension can be quite useful for users who often encounter situations where they need to reload pages until information on these pages change. It can also be handy on news aggregators like Reddit or forums like 4Chan to keep up with new links and information posted on the sites.